Deep convective clouds will be the focus of an upcoming ARM field campaign in Texas. Photo is courtesy of the National Weather Service. Deep convective clouds—the kind that often pack lightning and pour rain—occur nearly everywhere in the world. They are an important feature of the atmosphere, especially in storm systems that dominate the tropics and midlatitudes. Outside the realm of verse, scientists are still struggling to know what goes on inside convective clouds—exactly how their “fierce legions” of energy and mass combine and interact. Says Michael P. Jensen, a meteorologist at Brookhaven National Laboratory in Upton, New York: “We still don’t understand important details about how atmospheric convection works”—at least not well enough to represent convective clouds in models with acceptable accuracy. In particular, many researchers are vexed by how aerosols influence the physics of such clouds, including the precipitation processes and vertical velocities that affect rates of cloud growth, ice formation, and lightning occurrence. Aerosols are solid or liquid particles dispersed into the atmosphere by natural sources (such as tree cover) and artificial ones (such as cars and coal plants). Under the right conditions, aerosols help clouds form, and in this way play an important part in weather and climate patterns. Finding out what happens inside deep convective clouds is the aim of a new field campaign for which Jensen is principal investigator. The Tracking Aerosol Convection Interactions Experiment (TRACER) got the go-ahead in mid-October 2018 from the U.S. Department of Energy’s Atmospheric Radiation Measurement (ARM) user facility. With ARM mobile instruments in place, TRACER is scheduled to run from April 2021 to April 2022 in and around Houston, Texas. To date, he adds, the microphysical processes within convective clouds are represented only in a limited way in the parameterizations used in models of both weather and global climate. One related controversy is prominent today among scientists, says Jensen. Do aerosols invigorate deep convective storms? Some scientists say yes: Such particles affect the growth of cloud droplets, accelerate updrafts, cause more rain, and enhance turbulence and mixing. Jiwen Fan, an atmospheric scientist at Pacific Northwest National Laboratory (PNNL) in Richland, Washington, argued for the rain-making power of fine aerosols as lead author of a 2018 paper in the journal Science. Other scientists doubt a connection. Meanwhile, present climate and weather models overestimate how strong these updrafts are within convective clouds. It’s one of the model biases—offsets from observations—that TRACER is designed to correct. In 2011, Michael P. Jensen, second from left, was principal investigator for MC3E, one of the ARM field campaigns that informed the TRACER science plan. With Jensen, from left, are Scott Giangrande and Pavlos Kollias, who are now TRACER co-investigators, and Nitin Bharadwaj, principal engineer for ARM’s radar group. Planning to join Jensen in TRACER are 35 co-investigators from around the world—a group that he says brings expertise in convection, cloud-aerosol-precipitation interactions, atmospheric modeling, radar meteorology, aerosol and atmospheric chemistry, and lightning. Many of the co-investigators are also members of the group that Jensen says originated the idea of the TRACER field campaign in Houston: the Aerosol, Cloud, Precipitation, and Climate (ACPC) working group, which has been meeting for a few years. It’s a joint initiative of the International Geosphere-Biosphere Programme and the World Climate Research Programme. At an April 2016 meeting at the University of Oxford, the group identified case studies of deep convective clouds near Houston as the focus of a possible way to investigate aerosol impacts on convection. In October 2017, NASA cloud modeler Ann Fridlind and urban aerosols researcher Susan van den Heever of Colorado State University co-led ACPC’s Deep Convective Cloud Case working group, which developed a road map for what evolved into TRACER. Jensen became involved soon after concrete plans for an ARM campaign proposal began to materialize. “A lot of groundwork was done before the (TRACER) proposal writing even started,” he says. ACPC pilot studies focusing on the Houston area illustrated the diversity of responses among models regarding the influence of aerosol perturbations on convective precipitation. The pilot studies defined the primary seasons and locations where convective clouds occurred. They also showed how important high-resolution observations of the convective core were to addressing questions of aerosol invigoration. In Observations and Modeling of the Green Ocean Amazon (GoAmazon2014/15), scientists used ARM Mobile Facility (AMF) instrumentation to measure the extremes of air quality in the pristine central Amazon rainforest and the nearby industrialized city of Manaus. They also gauged the impacts of aerosols on clouds and precipitation in the Amazon region. That issue will be solved by the addition of a second-generation C-Band Scanning ARM Precipitation Radar (CSAPR2) to the AMF toolbox. The CSAPR2 is on its first deployment, as part of the Cloud, Aerosol, and Complex Terrain Interactions (CACTI) field campaign in Argentina. CACTI is scheduled to run through April 2019 and is directed by yet another TRACER co-investigator, PNNL’s Adam Varble. 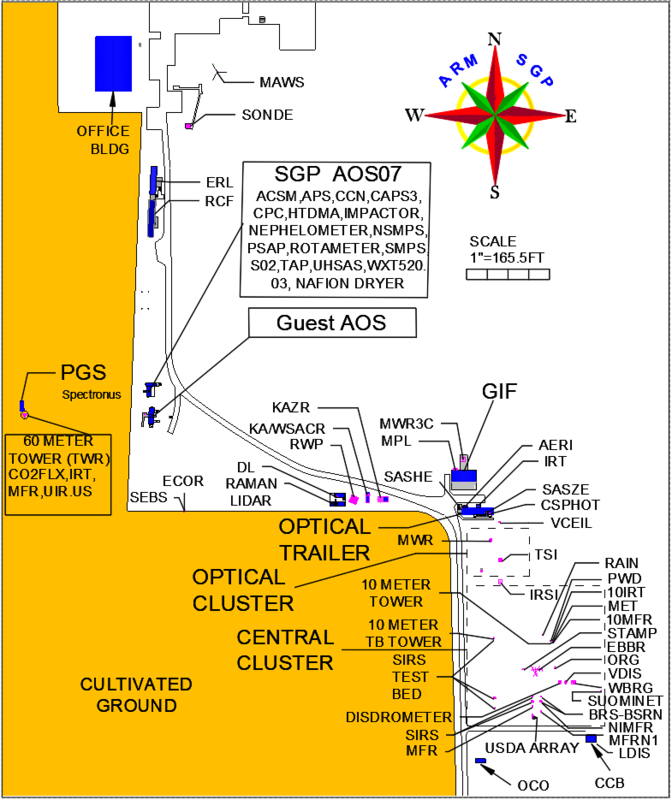 Proposed deployment locations have been identified for the first ARM Mobile Facility (AMF1) near the La Porte, Texas, airport; the CSAPR2 near Manvel-Croix, Texas, with 25 km and 75 km range rings; and an ancillary ARM site. Map data: Google. One of the older papers cited in the TRACER science plan is a 1983 historical review of land and sea breeze models, an issue that will gain new currency during TRACER. Scientists will be able to study how clouds and aerosols in an urban area are influenced by oceanic air circulation—in this case, from the Gulf of Mexico. It’s one of many atmospheric factors that made Houston an attractive venue for a convection campaign. Jensen believes TRACER is the first sustained ARM campaign in an urban area—one that will last a full year in a humid subtropical climate regime that spawns frequent convective storms, especially during summer. A four-month intensive operational period from June through September 2021 will take advantage of stepped-up seasonal storm frequency—with more scientists participating (most of them remotely), and with more measurements being taken and more radiosondes being launched. Houston also offers an intriguing variety of aerosol sources and loading conditions—an opportunity to work with measurement systems already in place and to investigate the influence of the city’s urban heat island. Such heat islands are warmer than a city’s surrounding rural area and are caused by heat-absorbing hard surfaces and by concentrated human activity, including traffic and industry. The Texas Commission on Environmental Quality has 75 monitoring sites within the Houston metropolitan area, collecting measurements on particulate matter and surface meteorology. The plan for TRACER proposes three instrumented sites. The exact locations will not be final until a visit by the AMF site management team, currently led by Heath Powers of Los Alamos National Laboratory in New Mexico. Also weighing in will be PNNL’s Nitin Bharadwaj, principal engineer for ARM’s radar group. AMF containers and their peripherals will be deployed somewhere fully within Houston’s footprint of industrialized air. An ancillary observation site in a non-urban area will record the relatively unpolluted background state of the atmosphere during TRACER. Somewhere between these two sites will be the CSAPR2, scanning the sky and peering into clouds. The microphysical processes of convective clouds “are hard to measure, and occur at very small scales,” says Jensen. The CSAPR2 will help, as will the confluence of other ARM instruments, embedded within Houston’s pre-existing observational networks. He imagines a best-case CSAPR2 scenario. Clouds form over the ancillary site, where the air is relatively free of aerosols from industry and transportation. A cloud system passes over the CSAPR2 site. Then the same formation, still within scanning range, is investigated for how city aerosols affect it. By 2021, Jensen will be one of many researchers praying for rain and for Goethe’s “mad thunder-cloud,” which needs the closer study TRACER can provide. ARM is a DOE Office of Science user facility operated by nine DOE national laboratories.